There was a change at the LBL leadership position after last games. Round 12 most important game was a defeat of league's leader Al Riyadi (9-2). They were defeated by second ranked Champville (9-2) 85-75 on Friday night. It ended at the same time the four-game winning streak of Al Riyadi. It was a key game for the top position in the league. Champville dominated down low during the game scoring 52 of its points in the paint compared to Al Riyadi's 28. 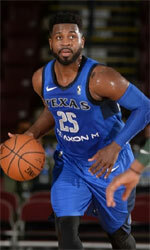 Worth to mention a great performance of American forward Dewayne Jackson (203-90, college: Morgan St., agency: Higher Vision Sports) who helped to win the game recording 31 points and 9 rebounds and the other American import guard Demarius Bolds (193-84, college: Missouri Western) who added 25 points and 5 assists during the contest. The best for the losing side was naturalized Egyptian power forward Ahmad Ismail (205-76) with 8 points, 14 rebounds and 5 assists. Champville have an impressive six-game winning streak. They keep a position of league leader, which they share with defeated Al Riyadi. Important game to mention about took place in Beirut. Sixth ranked Hoops Club (4-6) saved a 2-point victory at home edging 5th ranked Byblos (4-7) 64-62 in the fight for the fifth place. The winners were led by American point guard Willie Warren (193-89, college: Oklahoma) who scored that evening 26 points, 5 rebounds and 4 assists and Ibrahima Thomas supported him with 11 points and 12 rebounds. Even a double-double of 11 points and 13 rebounds by American forward Aaron Nelson (205-91, college: S.Indiana) did not help to save the game for Byblos. Hoops Club moved-up to fifth place. Byblos lost third consecutive game. They dropped to the sixth position with seven games lost. Fourth ranked Beirut Club (6-4) crushed at home 9th ranked Sagesse (1-9) by 23 points 89-66, which is the biggest margin this round on Monday night. The best player for the winners was Ali Haidar who had a double-double by scoring 25 points and 16 rebounds. Beirut Club's coach Patrick Saba felt very confident that he used entire bench which allowed the starters a little rest for the next games. At the other side the best for losing team was Sabah Khoury who recorded 17 points and 7 assists. Beirut Club maintains fourth position with 6-4 record. Sagesse lost eighth consecutive game. They stay at the bottom place with nine games lost. In the last game of round 12 Atlas F. was destroyed by Homentmen on the opponent's court 87-65. There was a change at the LBL leadership position after last games. Round 12 most important game was a defeat of league's leader Al Riyadi (9-2). They were defeated by second ranked Champville (9-2) 85-75 on Friday night. It ended at the same time the four-game winning streak of Al Riyadi. It was a key game for the top position in the league. Champville dominated down low during the game scoring 52 of its points in the paint compared to Al Riyadi's 28. Worth to mention a great performance of American forward Dewayne Jackson (203-90, college: Morgan St., agency: Higher Vision Sports) who helped to win the game recording 31 points and 9 rebounds and the other American import guard Demarius Bolds (193-84, college: Missouri Western) who added 25 points and 5 assists during the contest. 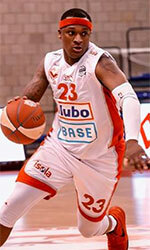 Bolds is a former Eurobasket Summer League player, which is considered top international summer league in the market. The best for the losing side was naturalized Egyptian power forward Ahmad Ismail (205-76) with 8 points, 14 rebounds and 5 assists and American guard Mark Lyons (185-89, college: Arizona, agency: Higher Vision Sports) scored 22 points (went 9 for 9 at the free throw line !!!). Champville have an impressive six-game winning streak. They keep a position of league leader, which they share with defeated Al Riyadi. Important game to mention about took place in Beirut. Sixth ranked Hoops Club (4-6) saved a 2-point victory at home edging 5th ranked Byblos (4-7) 64-62 in the fight for the fifth place. Strangely Byblos outrebounded Hoops Club 54-41 including a 25-10 advantage in offensive rebounds. They brought some defensive toughness making 7 blocks. The winners were led by American point guard Willie Warren (193-89, college: Oklahoma) who scored that evening 26 points, 5 rebounds and 4 assists and Senegalese forward Ibrahima Thomas (213-87, college: Cincinnati) supported him with 11 points and 12 rebounds. Even a double-double of 11 points and 13 rebounds by American forward Aaron Nelson (205-91, college: S.Indiana) did not help to save the game for Byblos. The former international power forward Ali Kanaan (207-85, college: Mass.-Lowell) added 6 points and 16 rebounds. Hoops Club moved-up to fifth place. Byblos lost third consecutive game. They dropped to the sixth position with seven games lost. Very expected game in Beirut where 8th ranked Atlas F. (2-8) was crushed by third ranked Homentmen (8-2) 87-65 on Sunday. The best player for the winners was U.S. Virgin Islands-Puerto Rican point guard Walter Hodge (183-86, college: Florida) who scored 21 points and 6 assists. American power forward Chris Johnson (210-85, college: LSU) chipped in a double-double by scoring 14 points and 11 rebounds. Four Homentmen players scored in double figures. Homentmen's coach Joe Nebhan felt very confident that he used 11 players which allowed the starters a little rest for the next games. At the other side the best for losing team was American power forward Darian Townes (208-84, college: Arkansas) who recorded a double-double by scoring 26 points and 17 rebounds and point guard Joseph Zaloum (180-90) added 4 points and 7 assists respectively. Defending champion maintains third position with 8-2 record behind leader Champville. Atlas F. lost fourth consecutive game. Newly promoted team keeps the eighth place with eight games lost. Fourth ranked Beirut Club (6-4) crushed at home 9th ranked Sagesse (1-9) by 23 points 89-66, which is the biggest margin this round on Monday night. Beirut Club outrebounded Sagesse 47-21 including a 35-17 advantage in defensive rebounds. They looked well-organized offensively handing out 22 assists. The best player for the winners was the former international forward Ali Haidar (201-90, college: Michigan Tech) who had a double-double by scoring 25 points and 16 rebounds. American guard Quincy Douby (190-84, college: Rutgers) chipped in 28 points. Beirut Club's coach Patrick Saba felt very confident that he used entire bench which allowed the starters a little rest for the next games. At the other side the best for losing team was the former international guard Sabah Khoury (196-82) who recorded 17 points and 7 assists and Aziz Abdel-Massih added 17 points respectively. Four Sagesse players scored in double figures. Beirut Club maintains fourth position with 6-4 record. Sagesse lost eighth consecutive game. They stay at the bottom place with nine games lost.